South Korea is the only country in the world known to intensively breed dogs for human consumption. Thousands of dog meat farms across the country breed an estimated 2.5 million dogs each year who are confined in small, barren cages outdoors. They live in states of perpetual fear, boredom, hunger and disease, often resulting in self-mutilation. For those who survive, their fate is a brutal death at one of the nation's markets or slaughterhouses. Most people in South Korea don't regularly eat dog meat. Public opinion is turning and, like us, they agree that dogs are friends not food and that all dogs are equally worthy of compassion and protection from cruelty. 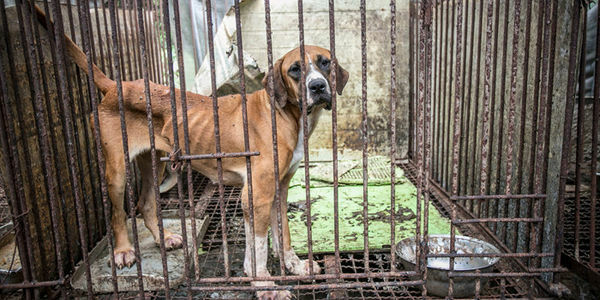 Humane Society International and our partners are committed to ending the dog meat industry in South Korea, by exposing the cruelty, raising vital public and political awareness, and increasing support for a phase out. A vital step towards this goal is the legal recognition of all dogs as companion animals protected from cruelty. I am deeply concerned about the millions of dogs caught up in South Korea's brutal dog meat industry, and I respectfully urge you to take action to protect them. South Korea is the only country in the world known to have established a large-scale intensive dog meat farming industry, in which more than 2.5 million dogs a year endure brutal lives and painful deaths for their meat - a delicacy food that fewer and fewer Koreans choose to eat. The suffering of these dogs is undeniable. They are kept in small barren cages, without protection from the harsh elements or even a solid floor on which to stand. Physical injury from self-mutilation or fighting are commonplace, and death from disease, hunger, or exposure is rife. For those who survive the grim farm life, death by electrocution is painful and terrifying. Furthermore, the indiscriminate use of antibiotics on these farms to keep the animals alive poses grave risks to human health. Across Asia there is an ever-growing number of countries and territories prohibiting the trade in and consumption of dog meat, on the grounds of human health risks, animal protection, and dogs' special roles as companion animals. Pet ownership is rising rapidly in South Korea and with that comes a responsibility to provide adequate legislation to protect animals from cruelty. Throughout the world, dogs loyally assist us as therapists in hospitals and schools and serve with our armed forces and police to protect us. Dogs on dog meat farms are capable of being just as loyal and loving. The dog meat industry is the ultimate betrayal of this special relationship. Public opinion polls in South Korea show mounting opposition towards this cruel industry amidst concerns for animal welfare and human health. Action to protect all dogs and cats from this inherently cruel industry would be applauded and celebrated nationally and globally. I applaud South Korea for its ongoing amendments to strengthen national animal protection laws. I respectfully urge you to enact legislation that identifies all dogs and cats as companion animals, regardless of breed or place of birth, and bans their slaughter for human consumption.